The latest frontier in smart transport technology may have just rolled into the cycling arena with the introduction of the LIVALL Bling Helmet, the world’s first smart cycling helmet that integrates communications, music, and smart lighting for added safety and interconnectivity. 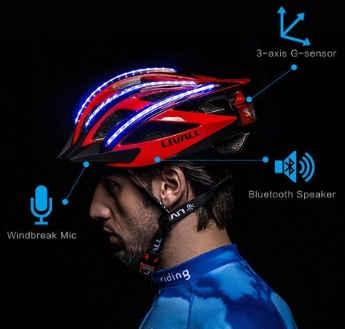 Featuring built-in Hi-Fi Bluetooth speakers and a microphone, the LIVALL Bling Helmet enables cyclists to make and answer phone calls to safely stay connected on the road. To communicate during group riding, LIVALL has also developed a Walkie-Talkie function to make it easier for cycling teams to communicate with each other and also converts text messages to voice. On the all-important safety front, it features 80 LED lights on the top and back of the helmet for better visibility and LED tail lights that show turning signals with a touch of a single finger on the included Bling Jet Remote Control, which is easily installed on the bike’s handle bars. Unlike traditional helmets, the LIVALL Bling Helmet not only protects the rider from getting hurt, but also sends out automatic SOS alerts to emergency contacts via the LIVALL Riding App when the built-in 3-Axis Gravity Sensor detects a strike. The Remote Control and Riding App not only control the tail lights but also easily play music, take phone calls, photos, videos, and more. Utilizing the LIVALL Nano Cadence Sensor, the smallest single unit cadence sensor in the world, the LIVALL Riding App also syncs with other smart wearable devices, like smartwatches or pedometers, providing data that helps cyclists improve performance, which they can then share on social media sites. The helmet also includes a phone holder to keep the phone handy with an internal power bank battery so there’s no need to worry about the phone running out of power during the ride. But there is indeed more. The Bling Helmet includes an internal Hi-Fi Bluetooth 4.0 smart speaker located on the helmet near the rider’s ear that lets cyclists enjoy music safely on the road. Featuring one-touch controls for start, stop, volume, song selection, and skip, cyclists can listen to their favorite tunes while still hearing road noise and car horns.